In growing areas such as the Research Triangle Park, there is always the tough decision between developing land for business, or keeping it natural for parks and recreation. SAS is fortunate to have the great hiking trails at Umstead Park just across the road to the north - it's the most-visited state park in North Carolina. And just one exit to the west is the great paddling, rowing, sailing, and biking at Lake Crabtree Park (which I featured in a recent blog post). Both of these recreation areas are adjacent to the Raleigh-Durham airport, and the land in between could either be used for further airport/business expansion, or more recreational/nature area. In this blog post, I create a custom map to examine the contested area. This past weekend, I spent my Saturday helping restore a grand old Sycamore Mess Hall building (formerly used by various camps and such) at Umstead Park. My job was to scrape old paint off the ceiling of the kitchen ... for 4 or 5 hours. During the lunch break, I got into an interesting discussion about the history of Umstead Park, and the potential future. I found out that the airport had originally bought a large chunk of land thinking it might need an extra runway, but had later determined they wouldn't need it. The airport then decided to investigate what other options might exist for the land, and there are several proposals being evaluated. On the Umstead Park (north) side of I-40, there is currently a rock quarry on the edge of the land, and as the rock runs out in the current location, they'd like to expand into the airport land. 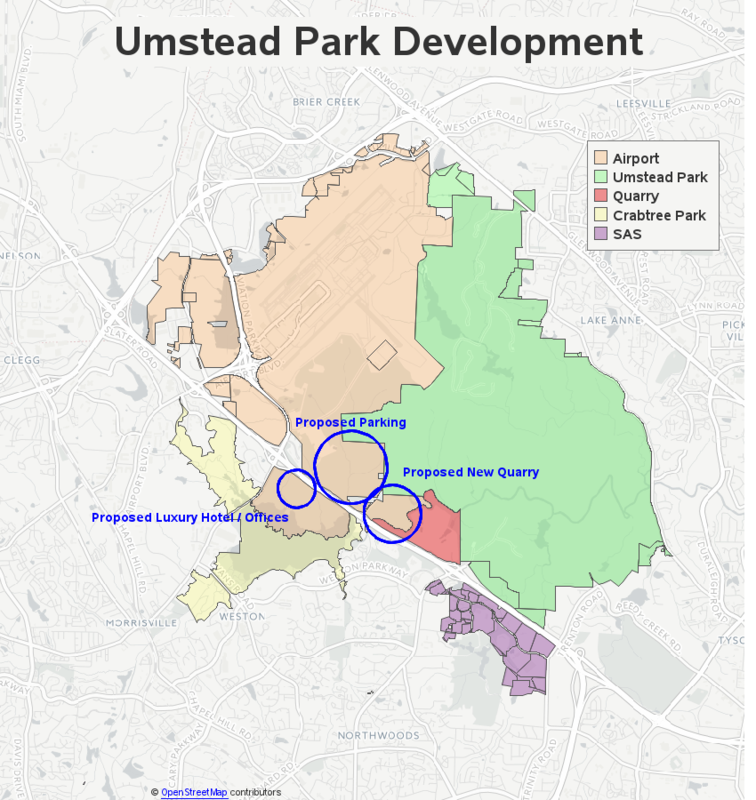 Also on the Umstead side, there is a proposal to add more satellite parking for the airport. On the Crabtree Lake (south) side of I-40, there is a proposal to build a luxury hotel and office park, with a nice view of the lake. I had a 'mental image' of all these locations, but I wanted to create a real image ... in the form of a map! Here's what my map looks like (click the image below to see the full-size interactive version with HTML mouse-over text, and drill-down links). If you'd like to create similar maps using SAS, I've included the technical details in the second half of the blog. 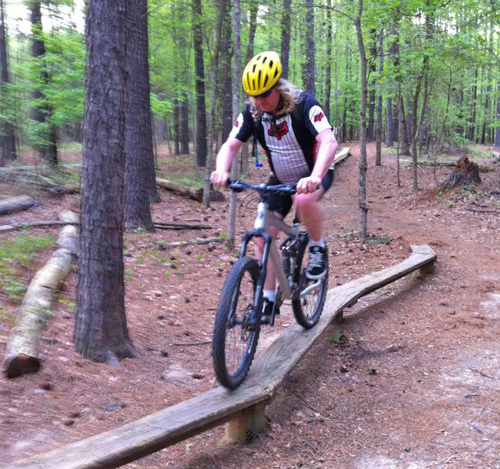 There are several key players with a vested interest in the negotiations over the contested land, such as: RDU airport, the RDU Airport Authority, Wake county, state of North Carolina, The Umstead Coalition, Triangle Off-Road Cyclists (torc), and RDUForest.com. I invite you to visit their websites to read more on their plans & preferences for the land, and you can even sign up to help or make suggestions on some of the websites. I bet you wouldn't have thought so much work went on behind-the-scenes to create that map, eh?!? It's not nearly this difficult to create a simple map (such as just a plain-old choropleth map), but when you want a map that the software wasn't originally set up to create, it's great to have the flexibility to write code to do whatever you want! Nice analysis! That could be any of us on a typical Saturday. As The Triangle grows, it is important to protect our greenspace. Robert: Great practical application. Thanks for sharing. 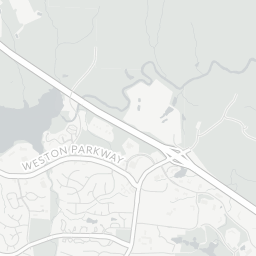 The actual boundaries of William B. Umstead State Park are larger than your map indicates. It is complicated since there are multiple PINS that make up the Park (shown in green in IMPAS). The PIN tracts that make up Umstead State Park: 0776275726, 0775364221, 0775542715, 0767993962, 0768914024, 0778007683, 0777452678, 0777344265, 0777424290, 0777700300, 0777704352, 0785187931, 0785187931. Ahh - thanks for the info! I'll see if I can include those PINs in my map!